This is how my dinner started last night. A tossed green salad of mixed greens, arugula and baby spinach leaves. You can dress it with your favorite salad dressing. The rest of this easy quick to make dinner is on the next page. This is a great afternoon snack. I opened the salad drawer of the refrigerator looking for something to eat. I try to have lots of alkaline foods around to grab when I get hungry for a snack. This day was a little challenging as it is the end of the week and I am going to the farmers market tomorrow. What I did have was a piece of celery, a small carrot, a red bell pepper and a beautiful avocado. I cut them up and dressed them with 1 tsp. apple cider vinegar and 3 tsp. olive oil. Personally I do not use salt or pepper on my greens. I prefer the natural state of them. But feel free to adjust the seasoning by adding salt and pepper to your taste. Remember, that you do not need lettuce to create a delicious little salad. This is a great salad and easy to make. I saw these beautiful watermelon radishes at the farmers market. Just fill a bowl with your favorite greens mixture. I used baby spinach, kale, finely minced, a mix of salad greens, and parsley. On top, I placed cucumber, carrots, celery and the watermelon radish slices. This is a very easy to make summer salad when the zucchini is at its best. Grate a few zucchini squash or you can easily substitute another variety. Dress it with lemon juice and olive oil. 1 Tbsp of lemon juice to 3 Tbsp of olive oil. Toss and season with salt and pepper. You can add a little fresh lemon zest and fresh parsley as well. Spread on a plate. Toss toasted almond slices on the top. I love making a big salad early I the week. Cover it with a paper towel and plastic wrap and you have a go to salad for at least 3-4 days. This all depends on how fresh your lettuce is. Hopefully it has been purchased at your local farmers market. This week I took advance of the fresh Frisée and Escarole. They originally came from the Mediterranean region. Frisée Is sometimes referred to as chicory. Related to endive. Escarole is from the same family of vegetables. I especially like the different textures of both the Frisée and Escarole. Curly and crunchy, smooth and full of flavors. Simply said, just delicious. Because they are not known as the sweetest of lettuces. I like to pair them with an assortment of sweeter options. Dressing: basic vinaigrette is 1 tablespoon apple cider vinegar, or fresh lemon, or orange or grapefruit juice to 3 Tablespoons of olive oil. I was at the farmers market yesterday and could not resist all the beautiful greens. I put this salad together to celebrate all the flavors in this bowl. I like making a large amount and keep it in my fridge. This will last a few days. 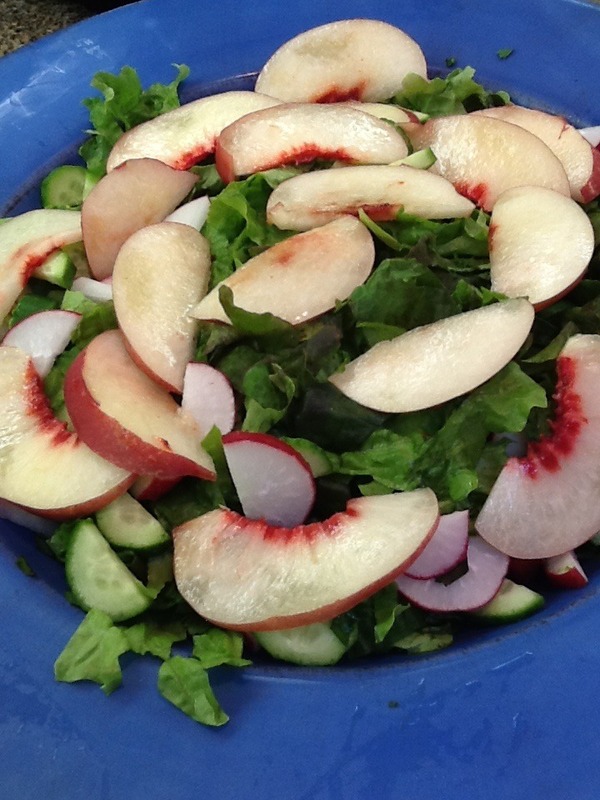 Add avocado slices when you serve this salad. Dressing is my usual go to, 1 tsp. of Dijon style mustard, 1 tsp. Apple cider vinegar 3 Tbsp olive oil. This is an adaption of a salad made by Giada De Laurentiis. I served it the other night and everyone thought it was delicious. Having a Food processor helps. But you can make it without. 1 bunch of kale. Chopped very fine. 2 bulbs of fennel. Sliced very thin. Dress with ¼ cup olive oil and the juice of 1 lemon. It’s best to dress this salad at least 3 hours before serving. This is kale. It is so good for us. Kale is low on calories, it provides us with calcium, vitamin A, vitamin C, and a huge amount of vitamin K. It also contains the minerals of copper, potassium, iron, manganese and phosphorus. But most of us do not know what to do with it. 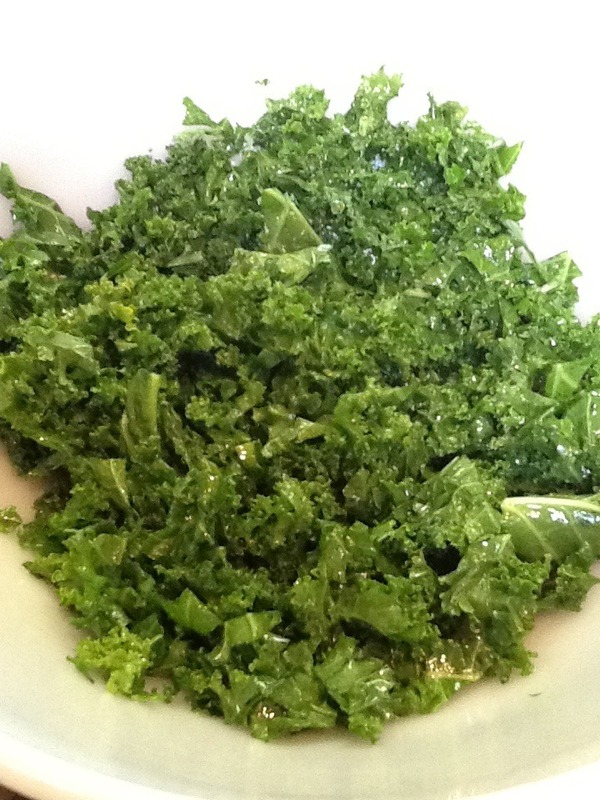 When using Kale in a salad, it is best to marinate it first. This will tenderize the kale and make it much easier to eat. Cut the kale off the stem. Chop finely. Place in a bowl. Dress with a light coating of apple cider vinegar and olive oil. Cover, and let sit for a few hours. It can even sit overnight in the fridge. When you make a green salad, add the kale, along with the other vegetables you use. I usually start with parsley, cucumber, celery carrots and avocado. I sometimes also use radishes, red bell pepper, toasted pumpkin seeds and toasted sunflower seeds. Having a salad is a great alkaline booster. Summer is almost over and soon the peaches will disappear. I bought these white peaches that were so sweet and delicious I just wanted to put them In everything I was making. These beauties ended up on my salad. If you have any fresh peach juice, reduce the vinegar and add the juice.